Come join us for an evening of wine and painting! 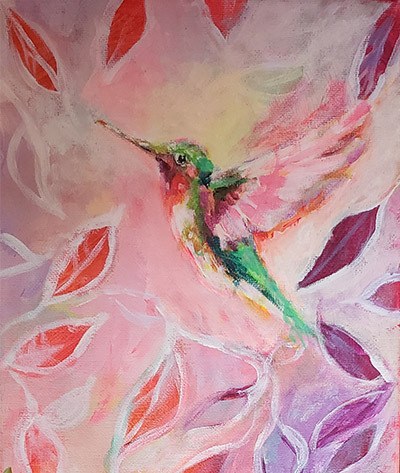 Follow a step-by-step demonstration and create your own colorful hummingbird and flowers. A fun, relaxed way of exploring painting techniques such as blending colors and composition with acrylic paint. Class is Sat. May 11, from 7-9pm. Diana De Moraes enjoys working in various mediums including, oils, acrylics, watercolor, encaustics, collage/mixed-media and pastels. She works extensively in portraiture and figurative painting and drawing. She attended a year of art school after high school, but became antsy and escaped to italy where she spent four years and eventually became trained in traditional painting restoration/conservation. Price is $28 plus $10 for supplies.